Sonia Gandhi (born 9 December 1946) is an Italian-born Indian politician, who has served as President of the Indian National Congress party since 1998. She is the widow of former Prime Minister of India, Rajiv Gandhi and belongs to the Nehru–Gandhi family. After her husband's assassination in 1991, she was invited by Congress leaders to take over the government; but she refused and publicly stayed away from politics amidst constant prodding from the party. She finally agreed to join politics in 1997; in 1998, she was elected as President of the Congress. She was born to Stefano and Paola Maino in Contrada Màini ("Maini quarter/district"), at Lusiana, a little village 30 km from Vicenza in Veneto Italy, where families with the family name "Màino" have been living for many generations.She spent her adolescence in Orbassano, a town near Turin, being raised in a traditional Roman Catholic family and attending a Catholic school. Her father, a building mason, died in 1983. Her mother and two sisters still live around Orbassano. The couple had two children, Rahul Gandhi (born 1970) and Priyanka Vadra (born 1972). Despite belonging to the influential Nehru family, Sonia and Rajiv avoided all involvement in politics. Rajiv worked as an airline pilot while Sonia took care of her family. When Indira was ousted from office in 1977 in the aftermath of the Indian Emergency, the Rajiv family moved abroad for a short time. When Rajiv entered politics in 1982 after the death of his younger brother Sanjay Gandhi in a plane crash on 23 June 1980, Sonia continued to focus on her family and avoided all contact with the public. Sonia Gandhi's involvement with Indian public life began after the assassination of her mother-in-law and her husband's election as Prime Minister. As the Prime Minister's wife she acted as his official hostess and also accompanied him on a number of state visits. In 1984, she actively campaigned against her husband's sister-in-law Maneka Gandhi who was running against Rajiv in Amethi. At the end of Rajiv Gandhi's five years in office, the Bofors Scandal broke out. Ottavio Quattrocchi, an Italian business man believed to be involved, was said to be a friend of Sonia Gandhi, having access to the Prime Minister's official residence. In 1980, her name appeared in the voter's list for New Delhi prior to her becoming an Indian Citizen, when she was still holding Italian Citizenship.It was a violation of Indian Laws. When she did acquire Indian Citizenship in April 1983, the issue cropped up again, as her name appeared on the 1983 voter's list when the deadline for registering had been in January 1983. Former senior Congress leader and the currently the President of India Pranab Mukherjee said that she surrendered her Italian passport to the Italian Embassy on 27 April 1983. Italian nationality law did not permit dual nationality until 1992. So, by acquiring Indian citizenship in 1983, she would automatically have lost Italian citizenship. After the assassination of Rajiv Gandhi and her refusal to become Prime Minister, the party settled on the choice of P. V. Narasimha Rao who became leader and subsequently Prime Minister. Over the next few years, however, the Congress fortunes continued to dwindle and it lost the 1996 elections. Several senior leaders such as Madhavrao Sindhia, Rajesh Pilot, Narayan Dutt Tiwari, Arjun Singh, Mamata Banerjee, G. K. Moopanar, P. Chidambaram and Jayanthi Natarajan were in open revolt against incumbent President Sitaram Kesri and quit the party, splitting the Congress into many factions. In an effort to revive the party's sagging fortunes, she joined the Congress Party as a primary member in the Calcutta Plenary Session in 1997 and became party leader in 1998. In May 1999, three senior leaders of the party (Sharad Pawar, P. A. Sangma, and Tariq Anwar) challenged her right to try to become India's Prime Minister because of her foreign origins. In response, she offered to resign as party leader, resulting in an outpouring of support and the expulsion from the party of the three rebels who went on to form the Nationalist Congress Party. In the 2004 general elections, Gandhi launched a nationwide campaign, criss-crossing the country on the Aam Aadmi (ordinary man) slogan in contrast to the 'India Shining' slogan of the BJP-led National Democratic Alliance (NDA) alliance. She countered the BJP asking "Who is India Shining for?". In the election, she won by a large margin in the Rae Bareilly constituency. Following the unexpected defeat of the NDA, she was widely expected to be the next Prime Minister of India. On 16 May, she was unanimously chosen to lead a 15-party coalition government with the support of the left, which was subsequently named the United Progressive Alliance (UPA). The defeated NDA protested once against her 'foreign origin' and senior NDA leader Sushma Swaraj threatened to shave her head and "sleep on the ground", among other things, should Sonia become prime minister. The NDA also claimed that there were legal reasons that barred her from the Prime Minister's post.They pointed, in particular, to Section 5 of the Indian Citizenship Act of 1955, which they claimed implied 'reciprocity'. This was contested by othersand eventually the suits were dismissed by the Supreme Court of India. Sonia is the widow of late Rajiv Gandhi, elder son of Indira Gandhi. She is a practising Christian. Sonia has two children, Rahul and Priyanka Gandhi, and there has been considerable media speculation for over a decade about their future role in politics. After a period of uncertainty, both Rahul and Priyanka became primary members of the Indian National Congress party. While Priyanka has so far restricted herself to organising her mother's election campaigns and taking care of Sonia's constituency, Rahul Gandhi has gone on to take formal charge as General Secretary of the Congress Party. He is also currently head of the Youth Congress. In August 2011, she underwent a successful surgery for an unspecified ailment in the United States. It has been widely speculated in the media that the surgery took place at Memorial Sloan–Kettering Cancer Center in New York. Newspapers reported that she returned to India on 9 September after her treatment. Speaking on 18 July 2012, about her son taking a larger role in the party, she said that it is for Rahul to decide. the dynasty has dominated the Congress party which has ruled India for most of the years since becoming an independent nation in 1947. The widow of former Prime Minister Rajiv Gandhi would have become India's first Roman Catholic prime minister had she not surprised everyone by turning the post down after her general election success in 2004. She said her inner voice had dissuaded her from taking the top job, but she remained leader of the Congress party. However, during the Congress-led rule of the United Progressive Alliance (UPA) her profile has increased and many Indians, including opposition parties, see her as a de facto ruler. Her influence over the party has never been in doubt. However, critics have questioned her political management skills and say she still depends on party managers to take key decisions. They say that under her curious alliance with technocrat Prime Minister Manmohan Singh crises have been allowed to develop, including the failure to keep Communist allies on side while pushing through a nuclear deal with the US. Before the surprise 2004 election win, Mrs Gandhi's future in Indian politics had looked somewhat uncertain. After distancing herself from politics following her husband's assassination in 1991, Mrs Gandhi was initially seen as a reluctant and almost reclusive politician. She officially took charge of the Congress party in 1998 and was elected to parliament in elections in 1999. Under her leadership, the party turned in its worst performance since independence in the 1999 general elections. Congress also performed indifferently in state elections in 2003. But the Gandhi name is still revered in India and Congress looked to Mrs Gandhi to translate that feeling into votes. In 2004, her political opponents attempted to rake up her Italian descent as an election issue saying the choice for voters was between an Indian or foreign leader. But their appeal to xenophobia apparently fell on deaf ears. Long before the election she surrendered her Italian passport in favour of full Indian citizenship. Sonia herself said in a television interview: "I never felt they look at me as a foreigner. Because I'm not. I am Indian." Her campaign was boosted by the entry of her son, Rahul, as a candidate. Her daughter Priyanka has also campaigned energetically for her. Though she turned down the post of prime minister, Sonia is seen to have shed her formerly taciturn manner, routinely working the crowds at political meetings and displaying a more combative approach. We have the power and we could teach those anti-social forces a lesson," she told one meeting, alluding to the perpetrators of the deadly Mumbai attacks of November 2008. Our patience should not be treated as our weakness... We will not tolerate any act against India." She was raised in a traditional Roman Catholic household. Her mother and two sisters still live in Orbassano. In 1964 she went to Cambridge to study English at a language school. Her life changed forever when she met her future husband, Rajiv Gandhi, who was studying engineering at the university. The couple married in 1968 and she moved into the house of her mother-in-law and then Prime Minister Indira Gandhi. She initially disliked Indian food and clothes and caused controversy when she was photographed wearing a miniskirt. But she spent the 1970s becoming steeped in Indian culture. Although she has learned Hindi, she is not a fluent speaker of the language. She no doubt also watched and learned as Indira fought a variety of political battles. 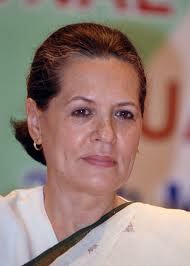 Italian-born Sonia Gandhi is the current torchbearer of the Nehru-Gandhi dynasty. She is widely considered to be the main backer of schemes including a more than $2bn (£1.4bn) food-for-work scheme often described as India's New Deal, and a landmark right to information law. "We have the power and we could teach those anti-social forces a lesson," she told one meeting, alluding to the perpetrators of the deadly Mumbai attacks of November 2008. "Our patience should not be treated as our weakness... We will not tolerate any act against India." Sonia Maino was born on 9 December 1946 in the town of Orbassano, near Turin, to a building contractor and his wife. In 1984 Indira Gandhi was assassinated by her Sikh bodyguards in retaliation for her decision to send troops into their holiest shrine, the Golden Temple. Rajiv became prime minister but seven years later tragedy struck the Gandhi family again. Sonia's husband was killed by a Tamil suicide bomber during a visit to Madras in 1991. She and her children, Rahul and Priyanka, were consumed with grief. Sonia resisted Congress attempts to persuade her to step into Rajiv's shoes and eschewed politics for several years. Eventually, in 1998, she agreed to become more involved but her initial efforts were overshadowed by Congress's humiliating defeat by the BJP in the 1999 election. In August 2000 she became a grandmother for the first time when Priyanka gave birth to a son. Earlier that year she asked a court to grant clemency to a woman who had played a part in the bomb attack that killed her husband. The court later commuted Nalini's death sentence. Sonia is a familiar figure in Amethi, her husband's rural parliamentary constituency in the northern state of Uttar Pradesh which her son Rahul now represents. She herself has represented the neighbouring seat of Rai Bareilly. She suffered a minor setback in 2006 when she had to surrender her membership of parliament, following allegations that she was violating rules by profiting from a second public post.